As I’m sure many more people would agree, I hated the SATs when I was in high school. I completely agree with you that there are infinite ways to measure someone’s intelligence, and basing their ability to be accepted into a good college mostly on one way seems ridiculous. You make a good point in bringing up the confounding variable of resources to show that standardized tests have at least some bias attached to them. They say they strive to make the tests unbiased, but it would be impossible to 100% do away with it. I’ve been very pleased to see some universities start making test scores optional. Overall, grades in school, extracurricular activities, and other factors are just as important as test scores, if not more so. Great job! I can honestly say, and although many people would disagree, I do not think there is anything more unfair than standardized test. 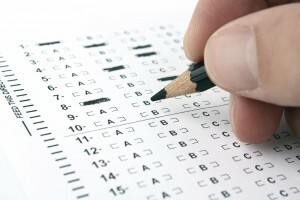 I do agree that is is fair that everyone in the country is given the same test and one isn’t easier than another but then again, how is fair that one test could determine your whole college career when you have hundreds of tests that you study for weekly throughout your four years of high school. When applying to colleges, I applied to many test optional schools because of how unhappy I was with my scores. Colleges going test optional is the best thing they can do in my opinion. I agree that standardized tests are not the best way to test a student’s understanding of a subject. Standardized testing is extremely outdated. It became popular back in World War 1. The world has changed so much since then. Testing a student’s knowledge needs to be revamped in a way that is more reflective of today’s society. Utilizing technology in more inventive ways would be a good start. But overall, the education system needs to catch up. Here are a few more reasons why standardized tests are utterly ineffective in today’s day and age. I loved reading this blog because like many other people I can totally relate. I do not believe that a standardized tests can show someones best work. How can one test show someones readiness for college? That doesn’t seem to make much sense for me? My older sister had dyslexia which makes test taking very difficult for her and I watched her struggle through her junior year constantly retaking the ACT’s because her scores did not reflect her true ability. She ended up applying to mostly test optional schools because her scores were not representative of her skills. By the end of the whole process she ended up at a great school, Purdue University, because they were test optional. Also the stress that these huge tests put kids often times make them do worse because of all the pressure that is put on them. Overall I think something needs to be done about the standardized testing for colleges. Schools shouldn’t be worried about what a student got on this one test they should be worried about there grades in school or their personal essay. Hannah, this blog is amazing! I’ve been thinking for a long time that standardized testing is an inaccurate way to measure the intelligence of any student, especially because some students with 4.0 GPA’s get nowhere near perfect on their SAT’s or ACT’s. I think it’s so accurate of you to say that aptitude is motivation. The best students, the ones that work the hardest, are the ones who have the motivation to stay on top of things and get their work done. Here is an interesting article that explains the reasoning behind colleges going test optional. Your blog really caught my attention because I am definitely not a great test taker. It does not mean I don’t study or pay attention in class, I get distracted easily and talk myself out of the right answers because I second guess myself. It is also hard to be tested on a range of everything learned in high school rather than specified material. I completely agree with the idea of test-optional schools because there are too many cofounding variables for everyone to have an equal chance at doing well on standardized tests whether students take tutoring classes (which, can be extremely expensive and unaffordable), or if they have ADD or ADHD or just get easily distracted after multiple hours of testing. Good article! My only advice would be to find sources on scholarly articles and not PBS or the New York times. I made that mistake last blog period and my grade suffered for it. Use Google Scholar to find good sources. This question is something that I think we all asked while we went through the SAT’s, what even is the point of this? I feel as though I wasted my time going through the test twice, but it probably gave me a better scholarship due to me getting a good grade. However, it may be biased to kids who can afford practice SAT exams and SAT prep over those who can barely afford to take the test once. Recently, more liberal arts colleges have been getting away from the SAT’s and ACT’s, instead focusing on write in’s and scores. This may be something we see more of in the future. I grew up with and continue to struggle with ADHD today, and these standardized tests were absolutely awful for me. I took all advanced classes and got only A’s and B’s up until my senior year. I was extremely close to being salutatorian! Despite all of this, I did extremely poorly on my SAT, and that score kept me from going to my first college of choice. Children with ADHD have been proven to not test well. Sitting down for hours in the same room with one task with little to no breaks is possibly the worst environment for a child with ADHD to work in. Children with ADHD produce much better work if they are able to take breaks every hour or so, get up and move around, maybe eat a snack. 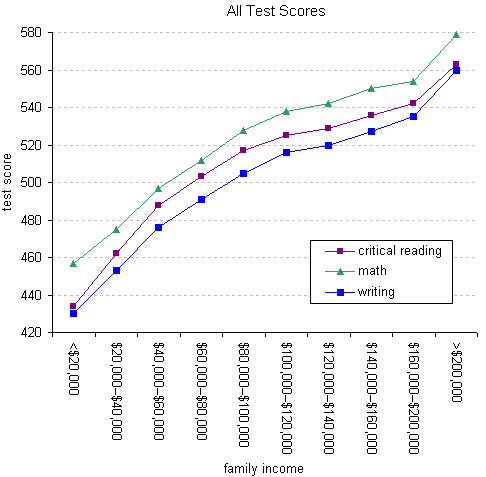 This also proves why students with ADHD, despite whether or not they test poorly, do far better in college. I no longer have to sit at a desk for eight hours with no breaks in between. The five minuet “breaks” between each class were barely enough time to get to my next class, let alone let my brain actually stop spinning. College classes are actually interesting, and there is so much more freedom in what classes they can take. People with ADHD can take classes they’re passionate about, and even if they dislike a certain subject, there are still so many more options other than three English classes of varying difficulties, which actually just boils down to the same lesson with just different amounts of homework. 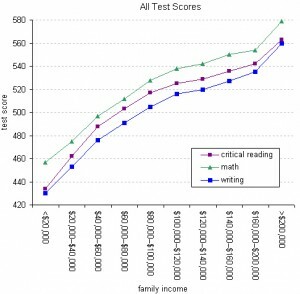 So not only does income affect children’s performance and show the flaws of standardized testing, children who have learning disorders such as ADHD have been proven to do just fine in college while they also fail to test well. Standardized tests are in no way a good way to gauge how children may do in college for so many reasons. I’m from Brazil, and down there we have what’s called the ENEM, or Exame Nacional do Ensino Médio (National High School Exam), which is basically a 2-day, 180 questions long test on every single subject covered in high school, from Physics to Sociology, with an essay-writing component thrown in as well. This was designed to ensure every high-schooler in the country is tested on the same basis, in this case academic performance (but that in reality is more like memorisation skill). While this doesn’t really give every student in the country the same opportunity at success because education in Brazil is opposite to the US (paid elementary and high school, free college), meaning less fortunate youths mostly can’t afford a high school education, I feel this is roughly the type of testing that could and most certainly should replace the ACT and the SAT here. As a high school education is pretty much guaranteed to everyone interested in learning in the US, the tests designed to test their academic proficiency could be so much more than just Maths, Science and English. Students could be tested on critical thinking, logic, creativity, and more, far surpassing simple essay writing. I feel this is what high school testing should prepare a student for, not memorising word definitions, mathematical formulas or scientific principles. They should be tested on their capacity to learn, not on the (mostly) useless stuff they only half paid attention to in school because it isn’t interesting in the slightest. Most schools still follow the same old 20th century idea that a good student knows Aristotle, Shakespeare and Mark Twain, can do Maths and knows how the cell gets its energy. This is not what education should be about. It should be about knowing how to solve problems and reflect on trends. The Greeks were doing it two and a half thousand years ago, and they’re regarded as the fathers of Western knowledge. A new world calls for a shift in paradigm, and I hope it happens sooner rather than later.